It’s another mattress battle! In one corner we have the largest and most well known mattress of the online mattress industry, Casper. In the other corner we have mattress startup, WinkBeds. How will the WinkBed’s luxury hybrid construction compare to the Casper’s lean and efficient build? Find out below in our complete Casper vs. WinkBed comparison. The Casper mattress is a hybrid foam mattress built from 3 different layers of foam. Hybrid mattresses are constructed from varying layers of foam (or other materials). The materials are layered in such a way to maximize certain benefits, while minimizing other negative attributes. The Casper is built from 4 layers of foam. The cover of the Casper breaks down into two pieces, the top piece (white) and side panels (dark grey). The top piece of white fabric is soft, has a nice stretch to it, and is fairly thin. Additionally, it’s also quite porous looking and feeling. The porous and thin fabric help to eliminate moisture from the sleeping surface and remain highly breathable, improving the cooling of the mattress. However, this same soft porous thin fabric is also susceptible to damage. The last time I was moving my Casper the fabric caught and ripped several of the threads out. You’ll want to be careful when moving the Casper to ensure you don’t damage it. The fabric along the side panels is much sturdier than the white fabric on top. It feels like it could better handle rough moves. Aesthetically, the cover has a modern design and look. The grey side panels and white fabric on top give the mattress a sharp contrast that looks quite nice. The Casper has a firmness of 6-7 out of 10 on the firmness scale (where 10 is the most firm). Many of my readers have emailed me regarding the Casper’s firmness level, which seems to vary based on the size of the sleeper. Light sleepers (less than 180 pounds) tend to find the Casper sleeps on the soft side, closer to a 6 out of 10. However, some of my readers (especially those above 200 pounds) seem to find that the Casper is firmer, closer to that 7 out of 10. The Casper has a fairly pronounced body hug and contour. However, it does not have the same type of deep enveloped feel that you’ll get with more traditional all memory foam mattresses. The foams remain highly responsive, meaning they quickly change and adjust to your movements during the night. The edges of the Casper are perhaps that weakest area of the mattress. Edge support is always a difficult area for foam mattresses. In a normal lying position you’ll find that as you get within 2″ of the edge you’ll begin to feel a slight collapse, increasing as you get closer to the edge. For sitting purposes the mattress collapses 2.5″ in a normal conservative sitting position and 4.5″ in an aggressive sitting position. The overall feel of the Casper is fairly balanced. Support is adequate in all sleeping positions and the mattress sleeps cool as well. The WinkBed is a hybrid mattress built of coil-on-coil springs and a foam blend. 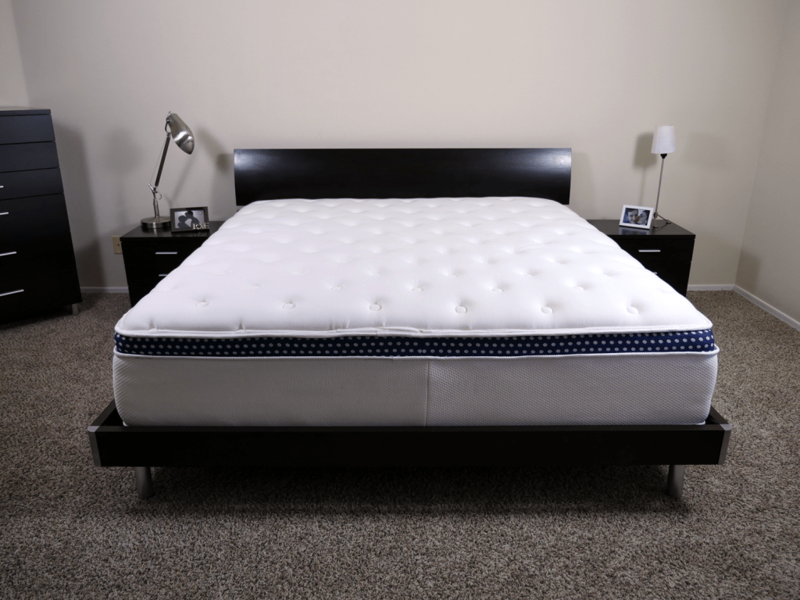 The 15″ mattress is a luxury mattress designed to offer a high-end feel and aesthetic. The WinkBed mattress is built from 4 different layers of coils and foam. Like the Casper, it’s also a hybrid mattress. This simply means that it uses varying types of materials to achieve an optimal level of comfort, support, and cooling. Top layer (comfort) – the sleeping surface of the WinkBed is a 2″ euro-style pillow top. It is stuffed with a blend of super soft foam and gel foam. This allows the sleeping surface to have an amazing comfortable and cooling feel. 2nd layer (support) – this is a 2.5″ layer of pocked coils. Pocketed coils simply means each coil is individually wrapped with foam. 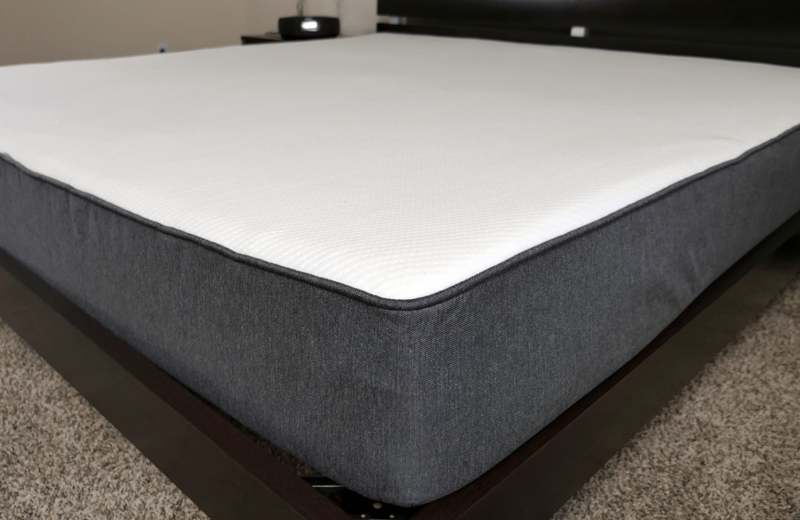 This allows the mattress to better contour and form to your unique shape, and provides a more luxurious feel (compared to that of traditional coils). 3rd layer (deep compression / transition) – this is an 7.5″ layer of high-profile coils. These are your traditional steel coils. They provide deep compression and act as a transitional support layer. Bottom layer (foundation) – this is a 2″ layer of high-density support foam. It acts as a foundational base for the mattress and helps provide shape. Edge support system (perimeter edge only) – running only the perimeter of the mattress is a foam edge support system. This firmer foam helps reinforce the edges of the mattress. 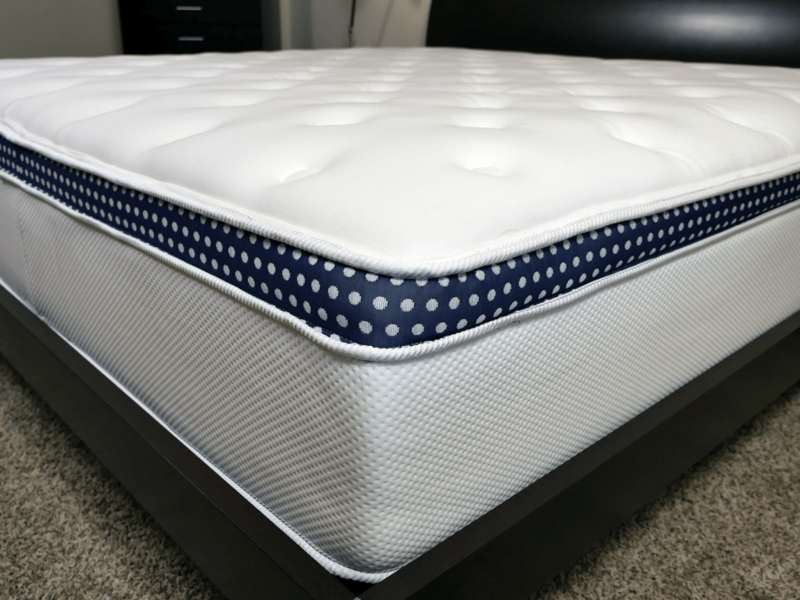 Stronger edges help provide better support for sleeping (near the edge), improve mattress amorous activity, and improve sitting on the edge. The fabric on the cover of the WinkBed is made from Tencel fibers. Tencel is made from the Eucalyptus tree. It’s an Eco-friendly fiber similar to cotton in many ways, but with better moisture absorption. This moisture absorbing properties allow it to wick sweat away, keeping the sleeping surface cool. The euro-style pillow topper itself is extremely nice. Euro-style pillow toppers are similar to traditional pillow tops in feel, softness, and contour. The difference is merely aesthetic. 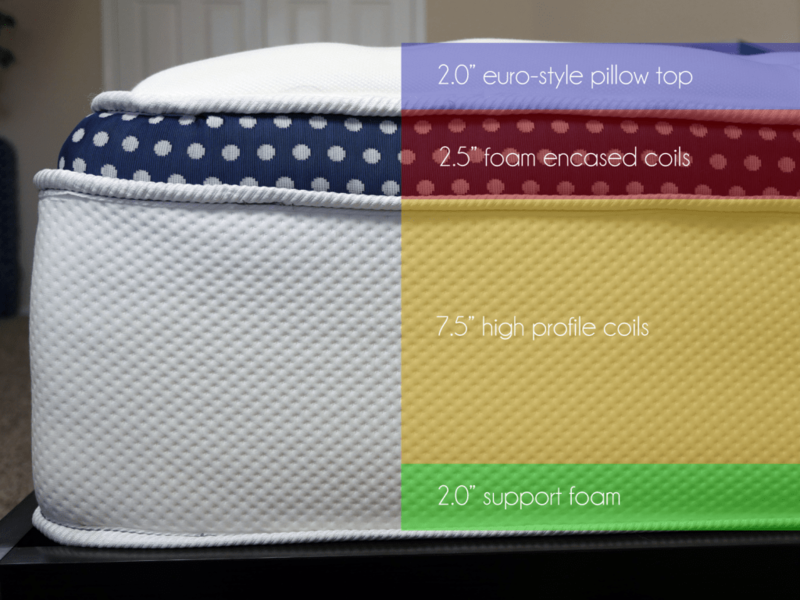 Euro-style means the pillow materials are stuffed within the primary mattress cover, and not sewn as a separate piece on top of the cover. This gives the cover a nicer look than traditional pillow toppers in my opinion. The design of the Winkbed is clean and modern. The all white color scheme on the top and side panels give it a very traditional look. However, the polka dots on a blue background return the Winkbed to more of a modern look. Overall, I quite like the cover design. The WinkBed medium comes in at a 6 out of 10 on the firmness scale (where 10 is the most firm). The euro-style pillow gives the WinkBed a traditional luxury innerspring feel. 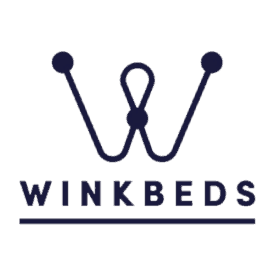 Unlike most foam mattresses, which provide deeper body contour and hug, the feel of the WinkBed keeps the sleeper supported more on top of the foam as opposed to sinking within the mattress. The WinkBed is also available in a soft and firm model. The soft WinkBed sits at a 4.5 out of 10 on the firmness scale and the firm lands at a 7.5 out of 10. The sleeping surface has a soft feel, similar to that of other 2″ pillow tops. Your body experiences the soft feel of the foam within the pillow top, but not a significant hug. This layer of soft foam sits on top of a large support layered structure, including high density foam, high profile coils, and pocketed coils. This combination creates strong edges, strong support, good deep compression support, and a balanced feel on top. The WinkBed also has good bounce, which is to be expected given the coil-on-coil construction. All in all, I feel like the WinkBed has a traditional innerspring mattress feel with the addition of a soft pillow top for added comfort. The contour and hug are minimized, which can be a benefit for sleepers who prefer a more classic mattress feel vs. a modern 100% foam feel. Discounts – $50 discount with code SLEEPOPOLIS50. Below is our complete side-by-side comparison of the Casper vs. WinkBeds mattress. Discounts None Available on Sleepopolis $50 off, use code "SLEEPOPOLIS50"
Should you buy the Casper or WinkBeds mattress? This was a difficult comparison for me, namely because Casper and the WinkBed are so different. Casper is a mattress for the masses, constructed with overall value and price in mind. WinkBed is a more luxurious build with a modern pillow top and design on a foundation of high quality coil-on-coil springs. Each mattress has its own pros and cons, your sleeping preferences and priorities will likely make one of these better suited for you. You want a medium firmness – Casper is a 6 out of 10 on the firmness scale. You want a more pronounced hug and contour – Casper’s all foam construction gives it deeper hug and body contour. The foams wraps around the sleepers unique shape to provide support and comfort. You want a balanced “one size fits all” mattress – The Casper has been designed to be a mattress suitable for the needs of most sleepers. As such, most people find the balanced hug, sinkage, bounce, and overall feel to be one that meshes well with their support and comfort needs. You want the best deal – Casper is significantly cheaper than the WinkBed. The difference on the Queen is $299 dollars (with all discounts applied). Want to choose your firmness – The WinkBed is offered in three different firmness levels (soft, medium, firm). These mattresses range from 4.5-7.5 out of 10 on the firmness scale, where 10 is the most firm. You want minimal hug – The WinkBed’s pillow top gives it a very shallow hug. It does not envelope the sleeper the same way the Casper or other 100% foam mattress will. You want strong edge support – WinkBed’s coil-on-coil construction and edge support system gives it exceptionally strong edge support for both sitting, sleeping, and amorous purposes. You want better bounce – innerspring construction = better bounce than foam mattresses, plain and simple.